Many of you probably gifted or received a jigsaw puzzle or a board game for Christmas. Did you know that these games are created in Polička in Eastern Bohemia? Ravensburger Karton s.r.o., is one of the most prominent global manufacturers of board games and puzzles, producing and exporting an unbelievable 31.5 million products per year. In order to meet the huge demand for its products, last year the company invested significant funds into the construction of a warehouse for 24 thousand pallet spaces and into additional production lines. This cannot be done without automation. Our company, in cooperation with a Slovenian partner, by now installed already the third Rotomatic palletizing and packing line. You can see what it looks like now in the video below. 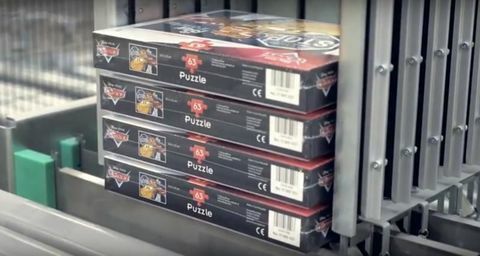 The production line for individual game boxes is followed by a high-performance palletizer, unique due to its amount of palletizing schemas – it currently assembles boxes on a pallet in accordance with 36 patterns. The user-friendly control panel also allows trained operators to modify the schema without needing a programmer (manufacturer of the machine). 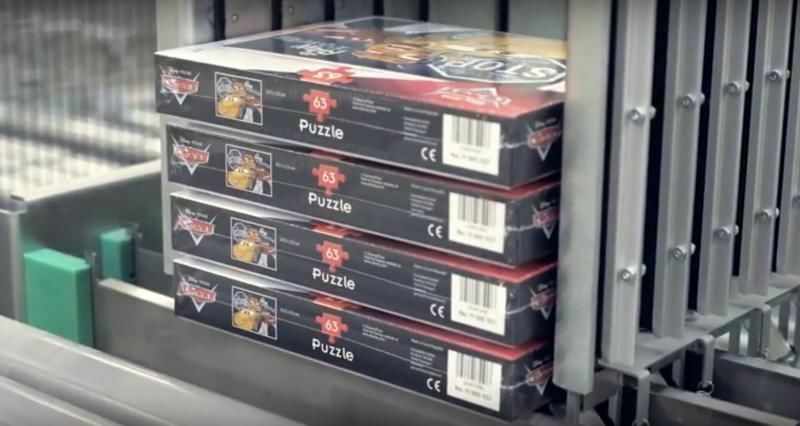 The palletizer processes up to 1800 boxes per hour; furthermore, the control system of the palletizer determines by how large are the stacks of the games in the previous stacking machine. This amount of entertainment also requires a high-performance packing machine for pallets, which is why we also integrated the Rotomatic Profile packaging machine into the system. Light, unstable boxes and high variability of pallet composition require the use of perfect machine equipment. The packaging machine also includes lifting of pallets, down-pressure for holding the goods on a pallet, a covering device for laying down the upper covering film and two motor-driven digitally controlled pre-loading films with roping, i.e., gathering the bottom edge of the film into a rope. In fact, I’d like to say a few more words about roping: The phenomenon of automatic pallet warehouses requires a different approach to the packaging of the pallet bottom. Bottom planks of pallets must not be packed in a film – there must be space for the sensor light to go through in order to ensure problem-free automatic storage. This why roping automatically bundles the stretch film together into a “rope” and perfectly fixes the goods to the top plank of the pallet, while letting detection beams of the automatic stacker through. (PICTURE of a pallet with a rope). You can see the whole line in the following video.